MENGO – The Federation of Uganda Football Associations (FUFA) has issued new guidelines on the distribution and selling of the Uganda Cranes jerseys and other merchandise. FUFA has noted with concern on the infringement of its registered, patented logos, commercial products including the Uganda Cranes jersey and has therefore come out to issue new guidelines that must be followed. 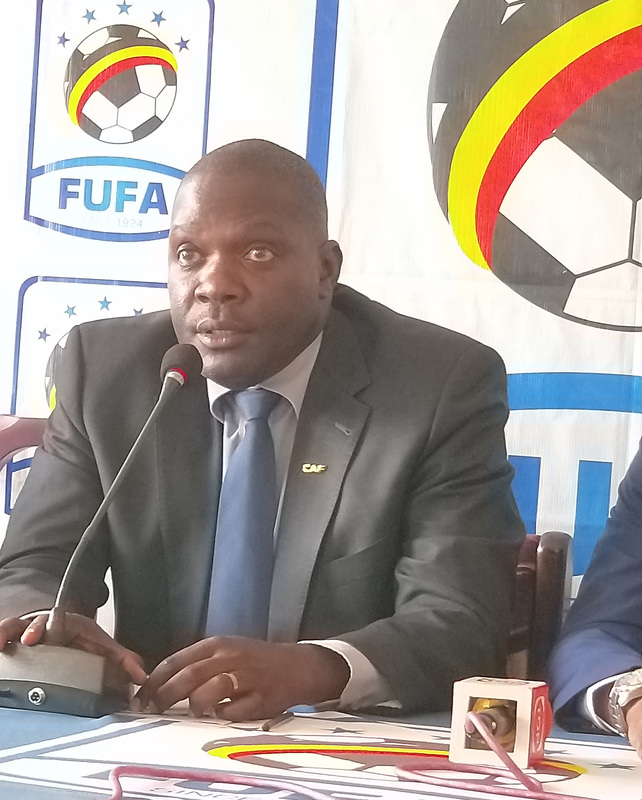 While addressing the media on Wednesday, FUFA Deputy CEO Humphrey Mandu indicated that there are counterfeit jerseys on the market but warned the public to avoid buying such products. Mandu stated that the Federation has opened the application process for willing distributors of Uganda Cranes jerseys. He indicated that every region of the country will have an authorised selling point/ distributor. In addition to having authorised distributors, FUFA has brought on board Busingye and Company Advocates who will oversee that the policy is enforced. ‘FUFA has signed a Memorandum of Understanding with Busingye and Co. Advocates who will be on top of the whole exercise to stop any dealings in fake Uganda Cranes jerseys’ stated the FUFA Deputy CEO. Norman Mbabazi who represented Busingye and Company Advocates during the press conference indicated that they will help the federation in making sure their brand is protected. FUFA Legal Manager, Dennis Lukambi stressed the fact that the Federation has full powers over its products and will not give chance to anyone duplicate them. ‘As FUFA, we have a Vision of becoming the number one football Nation in Africa on and off the pitch and protecting the game is one of the components of our mission. FUFA underwent rebranding and all the logos, names and features are all registered. In Uganda under the trademarks act, you can be imprisoned for selling what doesn’t belong to you. So we don’t want to ambush the public and that’s why we are making the sensitization. Members of the public should know that the logos and design were created by some people and FUFA paid for that work. Therefore it’s wrong for one to go and duplicate our work without permission. It is criminal to do such business’ noted Lukambi. The new Uganda Cranes Jersey manufactured by Mafro and designed by Umar Mukasa, who emerged as the best in the designing competition set by FUFA was unveiled on 10th October 2018.